Welcome to the 5th edition of my weekly BullCharts software Tip Sheets, focussing on tips and hints relating to the use of the Australian BullCharts charting software package. Some of the Elliott Wave enthusiasts are now also confirming their earlier comment that the next big and severe downward wave is under way. It's target price point and time frame depends on your wave count, and your Gann interpretation. Enough on the market. Let's get on with this week's BullCharts Tip Sheet. This week I am extending the information from last week on scans in BullCharts, and covering very specific information on the "Scan Criteria" topic. For introductory information, or other BullScan details, please see last week's Tip Sheet (in my web site archive - see the link below) or my Monthly Brainy's eNewsletter articles. BullCharts scans - "2. 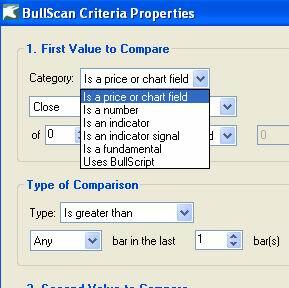 Scan Criteria"
"First Value to Compare > Category > price or chart field"
"First Value to Compare > open/high/etc?" In BullCharts, if you open an existing Scan or create a new Scan, there are four tabs in the BullScan Properties dialogue box. One of these tabs is "2. Scan Criteria". This is where you can specify a number of "things" (or properties) about the scan, to define which stock market data we will search through, and in which time period, and which time frame, as well as the individual "stock selection" (or "scan") criteria. To create a new Scan Criteria, simply click on the "New..." button near the bottom of the dialogue box. In the notes below, we take a quick look at just some of the available selection criteria. I will cover other options in future editions of Brainy's Tip Sheets. 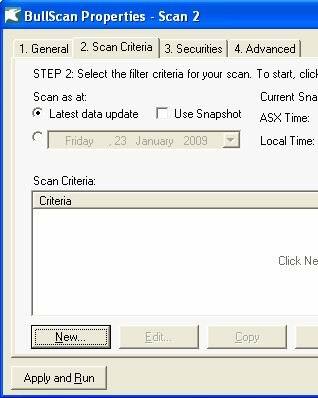 In the BullScan Properties dialogue box, if you click on the "New..." button to create a new Scan Criteria, the top portion of the next dialogue box ("BullScan Criteria Properties") looks like the figure here. If you view the details of the "Category" drop down, you will see there are six different types of values that we can use for comparison. In the text here we will only talk about the first option - "Is a price or chart field". But, note the other options, including: "Is an indicator", and "Is a fundamental". I will cover those in future Tip Sheets. 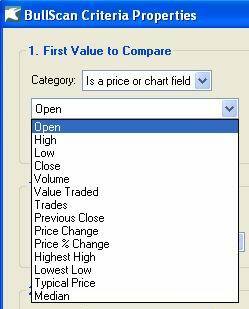 If you choose "Is a price or chart field" as the First value to compare (as described above), then you have 14 different choices for the next drop-down (see the accompanying figure). The most commonly used ones include: Open, High, Low, Close and Volume. But note there is also: "Value Traded" (ie. the dollar value), so that you might choose only stocks with more than, say, $100,000 traded in a day, or perhaps $500,000 in a week. Also "Trades" (ie. the number of buy/sell transactions in the period - day or week). You might want to choose only the stocks that have had more than, say, 50 trades in a day (or 250 in a week). This will help you avoid thinly traded stocks. If you want to exit the stock in a hurry, there needs to be enough liquidity. NOTE: If you have these criteria for stock selection, then they must be recorded in your written version of your Trading Strategy (see Brainy's Monthly eNewsletter articles for more details). Also note these options: "Previous Close", "Price Change", and "Price % Change". These help to compare a Close price to the previous close, or to look at the actual change in price compared with a Close price at some stage in the past - either in dollars, or percentage change. In the latter case, you might want to search for a stock that has changed by, say, 10% over a 5-day period. Two other useful ones are "Highest High" and "Lowest Low". You can use these to look for a situation over, say, an 8-bar period, or maybe 21 or 34 bars. If a stock is making Higher Highs, then perhaps an uptrend is confirmed? The last two on the list are "Typical Price", and "Median". More about these in a future article. Go back and set the "Type of Comparison". Just some of the different types of comparisons that are available are shown in the accompanying diagram. There are actually 23 in all. A useful and little known one is "Show this value", so that you can specify an indicator or price field, and simply "Show it" in the scan results table. In this situation, the "2. Second value to Compare" options are greyed out and not available. Other useful values to "Show" include some of the 20 "Fundamental" values: Total Issue, EPS, PE, Dividend yield, Dividend date, etc. There are far too many options here to cover in detail in these short Tip Sheets, so they will be covered in more detail in Brainy's Monthly eNewsletter articles. IMPORTANT NOTE: If you are comparing two price or chart fields, then there is something important to note about the "Type of Comparison". 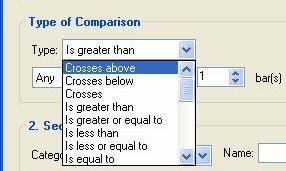 There are two more drop-down boxes: "Any/Every", and the number of bars for comparison. If the number of bars is set to one, then the Any/Every drop-down box is ignored. So it does not matter whether you specify "Any" or "Every". This can be a source of confusion for someone trying to understand how all this works.